The size of the board is 54 x 54 cm, the cells are 5.8 x 5.8 cm. The thickness is 1.2 cm. Weight is 2.9 kg. Production Poland. By mail is not sent! A very high quality and beautiful board with special grooves for the figures in the felt cover inside. The cell size is 50x50 mm. Gift wrap. Pr-in Poland. It has defects in veneer on the side surfaces. The cell size is 57 mm x57 mm. Oak veneer. The cost is indicated when you buy in Moscow. Check the price of the shipment when ordering. The cell size is 57 mm x57 mm. Oak veneer. The cost is indicated when you buy in Moscow. Check the price of the shipment when ordering. The board has minor damage to the veneer on the side surfaces. A very high quality and beautiful board with special indentations for figures inside. Board size 54 x 54 cm, cells 5.7 x 5.7 cm. Material - maple, cells are veneered with birch and mahogany. For chess pieces №6. Production Poland. The size of the board is 48 x 48 cm, the cells are 5 x 5 cm. The thickness is 1.2 cm. Weight 2.4 kg. Production Poland. 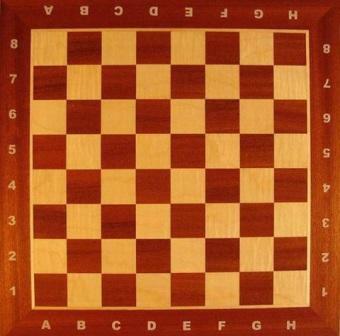 The board is 47x47 cm. The cell size is 5x5 cm.